It is with profound sadness that we announce the peaceful passing of our beloved mother, nonna, bis-nonna, loving aunt and friend on Wednesday, August 29, 2018 at the age of 97 years at Hogarth Riverview Manor. Maria was the first child of Concetta Costanzo and Carmine Maletta born on September 20, 1920 in Pedivigliano, Provincia Cosenza, Italy. In 1938 she married the love of her life, Felice Falvo, with whom she celebrated 65 years of marriage before his passing in 2004. In search for a better life, Felice immigrated to Canada in 1951 soon to be followed by his wife Maria and their four children. Life in their new country had its challenges and its joys, one of them being welcoming a fifth child born into their new home. Maria and Felice’s home was a gathering place for friends, neighbours and family. Their doors were always open and they would greet you with a smile and a hug. The house was always filled with the aroma of home cooking, homemade wine, fresh bread and pasta sauce. No one ever left hungry or empty handed. The grandchildren have special memories of many dinners and how they were urged on to “mangia, mangia”. Maria had an incredible green thumb. The produce from her backyard garden could feed an army. Her passion for her flower garden won her a City of Thunder bay beautification award. She was employed for a number of years at Westmount Hospital in housekeeping. She was a member of the St. Dominic C.W.L. and a longtime member of the Principe di Piemonte. Maria took pride in looking her best, personified the “look good, feel good: attitude and her home was her pride and joy. She is survived by her children Aurora (John) McKay, Fernanda (Leonardo) Favot, Ron (Vicky) Falvo and daughter-in-law Debbie Falvo. Nana will be greatly missed by her adoring grandchildren Lynn (Bill) Chambers, John (Debbie) McKay, Richard McKay (Carol), Leslie (Chris) Hynnes, Laura (Terry) Prodanyk, Paula (Matt) Skoviera, Mark (Lisa) Falvo, Dallas Falvo, and David Falvo and by her great-children Matt & Richard Chambers; Monica, Julia and Mark Prodanyk; Zoe, Piper and Camden Hynnes; Francesca Falvo; Nathan & Lydia Taylor and Ethan Skoviera. She is survived also by her sister-in-law Enerina Falvo (Vincenzo) and numerous nieces and nephews and other relatives in Canada, the US and Italy. She was predeceased by her parents Concetta Costanzo and Carmine Maletta, by her beloved husband Felice, sons Marcello and infant child Gian Carlo, her siblings Rosalbino Maletta (Italy) and his wife Adelaide, her loving sister Lidia Rizzuto & her husband Francesco, brother-in-law Mario Falvo and his wife Linda, brother-in-law Bruno Falvo and his wife Orsola, sister-in-law Anita Genovese and her husband Ferdinando and daughter-in-law Virginia Falvo. Maria & Felice lived a modest life, rich in the things that meant the most to them, family and the blessings of longtime friends. Prayers will be held at Blake’s Funeral Chapel, May St., on Tuesday, September 4, 2018 at 7pm with visitation beginning at 6pm. Family and friends will gather for Funeral Mass on Wednesday, September 5, 2018 at 11:30am at St. Dominic Church on Redwood Avenue celebrated by Rev. Msgr. P.M. Stilla, V.G. In lieu of flowers, donations can be made to the Heart & Stroke Foundation or a charity of your choice. 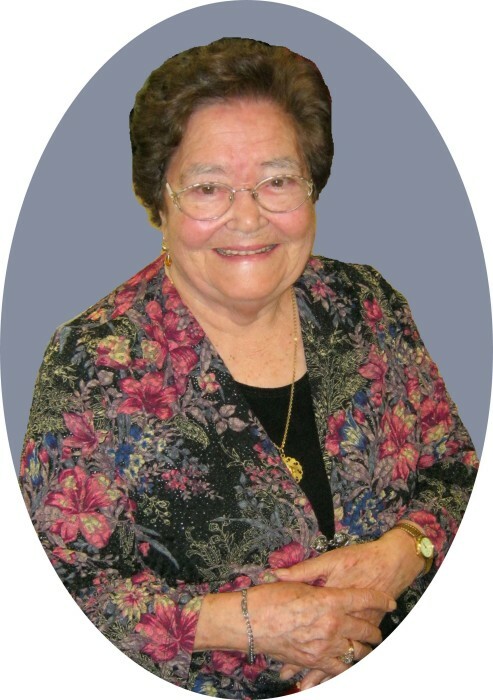 Maria Falvo will be remembered in the Blake Funeral Chapel Memorial Grove. Annual dedication service Sunday, June 9, 2019.